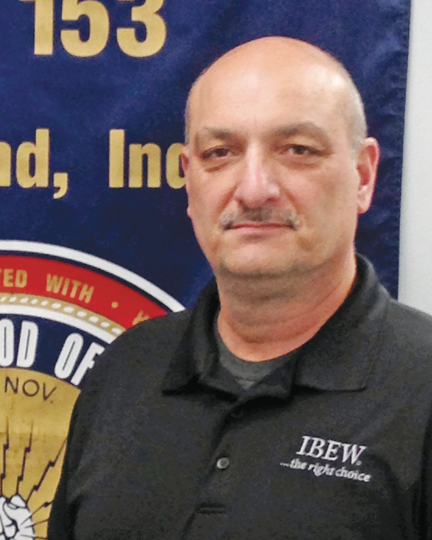 "I regularly ask our members to get involved in the community outside of the workplace," says South Bend, Ind., Local 153 Business Manager Mike Compton. Compton says his creed of "leading by example" pushed him into a successful campaign in 2006 for a seat on the Mishawaka, Ind. City Council. "I found out after my election that my fellow Democrats do not understand organized labor, especially the building trades," Compton says. And some Republicans, he says, have never had a discussion with a union representative. 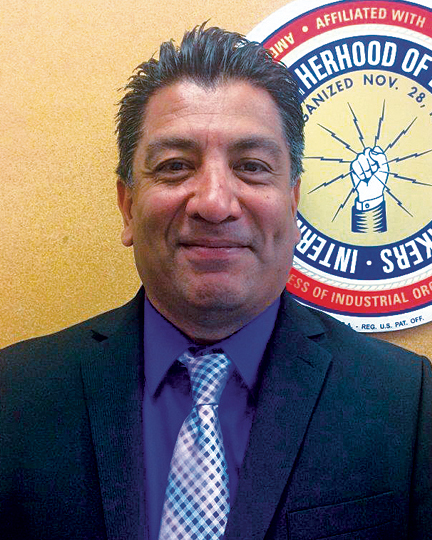 "My seat on the council gives me the opportunity to educate everyone I work with on the positives of organized labor and to put a friendly face on labor." Compton is not alone. Dozens of IBEW members serve in public office. At the top of the list is newly elected U.S. Rep. Donald Norcross (D-N.J.). But dozens more serve their communities and states on zoning and school boards, city councils and state legislatures. 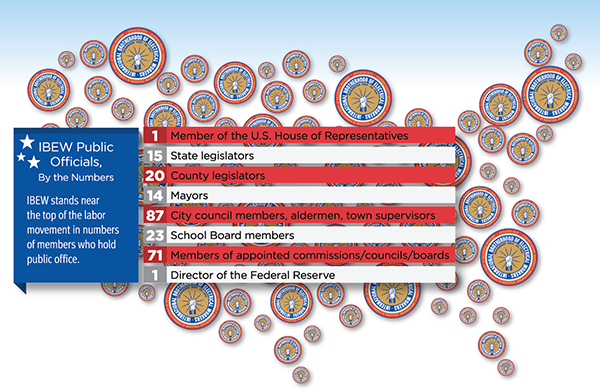 Many of these members balance the responsibilities of public office with the pressures and time constraints of jobs, union leadership and family responsibilities. But, like Compton, they say their efforts are essential to winning more influence and respect for working families in places of power and policy. Many say they have established decent relationships across partisan lines. And they urge others to join them. Even when they lose their campaigns, union members who contest for public office often come away with a sharper understanding of the importance of entering the political arena. In a blog post on AFL-CIO Now, F.X. Crowley, a member of the International Alliance of Theatrical Stage Employees summarizes the lessons learned in his unsuccessful campaign for a seat on the San Francisco Board of Supervisors where he lost by 132 votes out of more than 35,000 cast. "Running for office takes you from behind the curtain to center stage," Crowley says. Even in San Francisco, a city friendly to labor, he says, stereotypes prevail. "One voter said to me, 'You're not like a union guy. You're like the police and firemen I know.' Stereotype or ignorance, the voter's comment shows we had work to do," he adds. Without having members in public office, says Crowley, "It's like having your negotiation go into arbitration. You are at the mercy of the arbitrator. The same goes for politics. You are at the mercy of the elected." 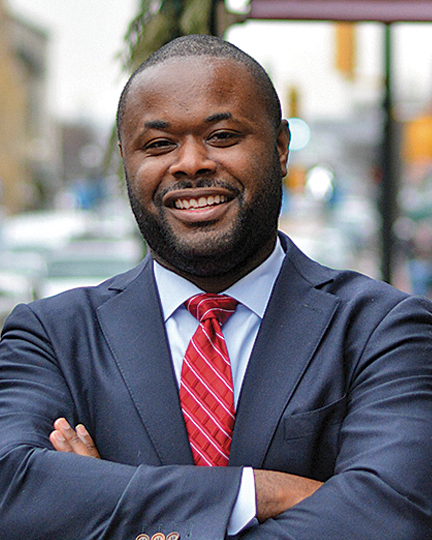 Last November, Cory McCray, a Baltimore, Local 24 membership development representative, won a seat in the Maryland House of Delegates after an extensive grassroots campaign which engaged dozens of young workers. McCray, a Democrat, who had run afoul of the law as a youth, immediately established relationships with Republican representatives. In short measure, he became the lead House sponsor of a successful bill that restored full voting rights for some ex-offenders who had paid their debt to society. "I learned how to organize [in the union] which helped me to develop and communicate a simple, effective message to my community and my fellow legislators," McCray says. Crowley amplifies the qualifications union members bring to the political process. "As negotiators, we are conditioned to find common ground and forge solutions. We bring a special skill set to democracy, which includes team building and meeting management. As active members of government, labor union leaders would build many more bridges, expand our opportunities to grow, and create an environment of mutual respect and trust," he says. Perspectives developed during union membership can be important for public officeholders even if they no longer belong to the union or share labor's agenda. During the recent vote in Wisconsin approving right-to-work legislation, the sole Republican to vote against the bill was state Sen. Jerry Petrowski, a former member of Wausau Local 1791. What can we learn from IBEW members who serve in public office? How do you win and make a difference? These are the questions we hope to answer. Next month, we will discuss the experience of IBEW members in public office in Canada, where two members are campaigning for federal positions north of 49. We invite all members in public office to contact media@ibew.org to discuss your experiences. A member of Baltimore, Md., Local 24, Cory McCray was elected to the Maryland House of Delegates last November. He has been working hard to promote healing and understanding in his inner city community after the tragic events following the death of Freddie Gray, who died while in police custody. Issues: "The main issues in my district are poverty, education and sanitation. Due to low incomes in some of the neighborhoods, we have food deserts, a lack of dining options, and a decreasing population. This can be resolved by bringing middle class jobs to the neighborhood, jobs which create disposable income to help grow our communities." Inspiration: "I am dedicated to creating opportunities for others to succeed. I have been successful. But the true measure of success is not just being successful, it's how many people you can bring along with you. When legislation and budgets include public employees and their working conditions, I am sitting in the room. As workers fight for pay equity, collective bargaining, or prevailing wages, they know they have at least one voice speaking up for them." Mike Compton, business manager of South Bend, Ind., Local 153 has served for nine years as a city councilman in Mishawaka, population 100,000. His mission: "When I am representing the citizens of my community, I try to keep a couple things in mind: How will my actions affect middle-class taxpayers and how will they affect retirees living on fixed incomes? When I am representing union members, I have the same line of thought except instead of thinking of taxpayers, I think of members." Reaching across the aisle: "I reach out to Republicans and invite them to tour our Electrical Training Alliance. I have found education and apprenticeships are an area that nearly everyone feels is important. It usually helps break the ice a bit and opens the door for further conversation. Peter Murray, a member of Martinez, Calif., Local 302, began his political career as a planning commissioner and has served on the city council of Pinole, Calif., a bedroom community east of San Francisco, for 23 years. 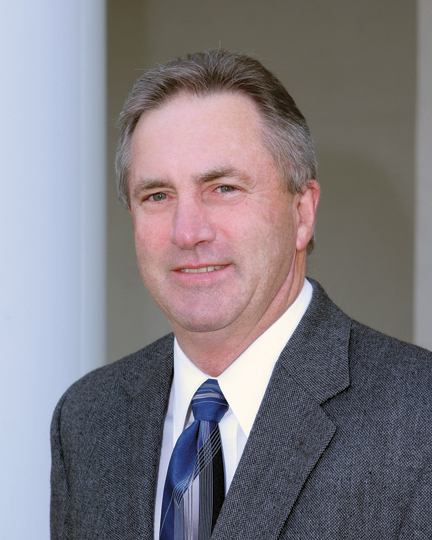 Murray, who has been mayor six times, has increased his percentage of the vote in every succeeding election in the city of 18,000. Keys to success: "I do things by the book. That makes it harder for anyone to question my choices. Communities like Pinole define a budget and live within it. My goal is to help maintain a balance so individuals can have a living wage. That means negotiating project labor agreements like we did for our water treatment plant." What union members bring to public office: "A lot of members think political offices are out of their reach. But we, the workers, are the ones who make things work. When you're on the job as an electrician, you're a problem-solver. You compete to get things done on time and on budget. You do the job right the first time. Sometimes you have to get into intricate detail and then make fast, but competent decisions. My job as a legislator is to make those competent decisions." Nick Segura, assistant business manager, San Diego Local 569, has a son in high school and a daughter who is almost there. His children were at the core of his motivation to run a winning campaign last year for a seat on the board of education for their high school district, the state's largest, with more than 40,000 students and 5,000 employees spread over 30 sites. 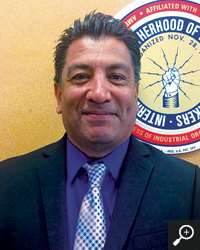 But Segura also knew winning a board seat would help him familiarize other members and his entire district with the excellent training offered by the IBEW and help the union give back to the surrounding community. His campaign: "I had knocked on doors for other candidates and had to reach out to 90,000 eligible voters. I made the commitment to run, in part, because one of the five candidates was an opponent of unions. Despite the large number of contenders, I won by a 33 percent margin with a lot of help from unions, including the teachers union." His experience so far: "I have worked with other board members and the Sweetwater Education Association to help students in a positive way. The administration's Common Core curriculum is controversial. But part of the plan is to focus on 'career-ready' curriculums. I have helped facilitate collaboration between public high schools and the electrical training center to prepare students to go to work on electrical, sound and 'smart' transportation projects. My fellow board members say they are amazed at what the IBEW has to offer and ask why they are just hearing about our training for the first time."